In the last three years, New York City has built 200 miles of bike lanes. Daily ridership is up—some estimates say it has nearly doubled since 2005—after years of tepid growth. During each morning rush, thousands of riders cross the four main East River bridges. Bikes crowd the Hudson River Greenway and are on the rise along First and Second Avenues, where the city has installed lanes protected from traffic by rows of parked cars. The city's streets now include 482 miles of lanes and a total of 1,800 miles are planned by 2030. What the city has discovered, though, is that remodeling its streets and increasing ridership is the easy part of building a bike town. It's a far greater challenge to change the habits of drivers, bikers and pedestrians in a dense urban environment with congested streets. Drivers see bikers as a nuisance: "They think they rule the road," said Doru Rosca, a taxi driver from Astoria. "Are we supposed to stop because they are riding against traffic?" Pedestrians see bikers as faster, less predictable and more dangerous pedestrians. And cyclists, for all their gains in population and political clout, still feel besieged by cars and expect little help from the police. The result, as Manhattan Borough President Scott Stringer witnessed last month, is often mayhem. "We've got seniors who think bike lanes are walkways. We've got police cars using bike lanes as a quick way around town. We've got taxi cabs pulling up so close to the bike lanes that a passenger gets out and actually doors a cyclist," Mr. Stringer said in a recent interview in his office. This fall, Mr. Stringer sent his staffers to the streets to document the chaos. The results, recorded over three days, astounded him: 1,700 total infractions by drivers, bikers and pedestrians, many of them egregious. "We have to do something about it," he said. To this point, the Department of Transportation has largely taken a "build-it-and-they-will-come" approach to cycling, much as other cities in the United States and throughout the world have done in the last few decades. Next year, it plans to beef up its awareness and outreach programs to alert New Yorkers to the new rules of the road. "We have to step up our game on the education front," DOT Commissioner Janette Sadik-Khan said in an interview last week. "There's a new street code out there and we need everyone to look out for one another and be safe." In the next few months, DOT will unveil several campaigns for radio, television and billboards. One series of television ads will take aim at cyclists who ride on sidewalks, pedal through red lights and go against traffic. The campaign, titled "Don't Be a Jerk," will feature prominent New Yorkers preaching bike etiquette. Mario Batali, the famed chef and restaurant owner, recently filmed a spot. Biking in New York is safer today than during any time in the city's history. As daily ridership has increased (some estimates claim it has almost doubled since 2005 to more than 200,000 daily riders), the yearly number of cycling fatalities and injuries has remained flat or declined, and the percentage of riders who are injured while riding has fallen dramatically. This year, however, the city will see a slight increase in the number of cycling fatalities and accidents in its year-over-year numbers, according to a Wall Street Journal analysis of data from the New York City Police Department. There were 19 cyclist fatalities in the city through October 31, seven more than in all of 2009. In the same period, 3,505 bikers were injured in crashes with motor vehicles, more than last year's total and up 20% compared to the first 10 months of last year. If the current rate of injuries continues, the percentage of daily riders who sustain injuries in 2010 will rise slightly. Such fluctuations are not uncommon when a city retrofits its infrastructure for bikes. Neither is conflict. In Portland, Ore., considered America's bike capital by many cyclists, there are still squabbles, especially on pathways shared by pedestrians and cyclists, according to Roger Geller, the city's bicycle coordinator. But Mr. Geller said several factors have contributed to improved relations and safety in his city: Increased biking, better education and improved coordination among city agencies, especially between transportation and law enforcement agencies. John Pucher, a professor of urban planning and public policy at Rutgers University, praised New York City for its infrastructure gains. "The cycle tracks, the signage and so forth, I think it's fantastic," Dr. Pucher said. But Dr. Pucher said other cities have accomplished more, largely because of better intra-government cooperation. Next year, Dr. Pucher will deliver a study, financed by the U.S. Department of Transportation, of cycling and urban transportation in nine cities: New York, Portland, Vancouver, San Francisco, Toronto, Montreal, Washington, D.C., Chicago and Minneapolis. "All of these cities, without a single exception, are doing more than New York," Mr. Pucher said. "They have better and more promotional programs. They have more training and education programs. They have infinitely better bike-mass transit integration, and better enforcement." Those cities also have a larger percentage of women and elderly who ride bikes, a sign, he said, that cycling is seen as safe. In Chicago, Dr. Pucher said, taxi and bus drivers are required to take courses on safe driving with cyclists. In Portland, motorists ticketed for cycling-related violations can take education classes in lieu of paying a fine. Paul Steely White, the executive director of Transportation Alternatives, would like to see similar practices adopted in New York. "Cycling is the fastest growing mode of transportation and there's virtually no access to education," Mr. White said. 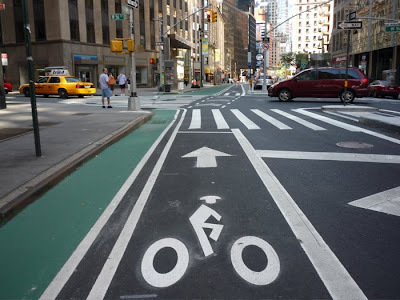 "Cycling has increased enough in New York to warrant a citywide institutional solution." "I can't speak to what's going on in other cities," Ms. Sadik-Khan said. "We're working very hard to do as much as we can to improve the education that we're doing, to improve the outreach that we're doing, and to improve enforcement by working with our partners at the NYPD." Lax law enforcement is a sore point among both pedestrians and cyclists. In the 19th Precinct, on the Upper East Side, dangerous cycling is the chief quality of life complaint among residents, according to the NYPD. In Park Slope earlier this month, a biker in his 40s ran a red light and crashed into 6-year-old Sean Frost as he and his nanny crossed Seventh Avenue in the crosswalk at the corner of P.S. 321. Jackelyn Frost, a psychotherapist, came home to find her son with a black eye. "The cyclist was knocked off his bike, and he just got back up and road off," Ms. Frost said. At the same time, cyclists and cycling advocates say the police don't do enough to keep bike lanes clear or to punish speeding and inattentive drivers who endanger them. The police department recently received a $150,000 federal grant to increase enforcement against drivers who speed and fail to yield to pedestrians and cyclists who violate traffic laws. The NYPD issued more than 29,500 summonses for bicycle infractions through October 31, up 7% from the same period in 2009. But NYPD spokesman Paul Browne said there was no crackdown in the offing, either against cyclists or motorists who interfere with cycling. "We're down 5,000 cops since 2001 and we've just been told that we have to get rid of 350 civilian places that were created to put cops who handled administrative duties on the street," Mr. Browne said. "That's a long way of saying, 'Yes, we want to do more in this area, but a grant of that size is not going to make a significant difference.'" Cycling advocates say a lack of enforcement breeds contempt for the law. The lawlessness Mr. Green and others described is easy to find: Pedestrians who routinely jaywalk and stand in bike lanes; a woman pushing a man in a wheelchair down the protected bike lane on Broadway; a bike messenger racing through a red light on Sixth Avenue; cars that use bike lanes as passing lanes; wrong-way cycling along the protected lane on First Avenue. But there are signs of change, too. Ian Dutton, a commercial airline pilot and a member of Community Board 2, said his own behavior, and the behavior of fellow riders, has improved. A recent evening presented a sign that there's hope for a friendlier future for all commuters. At dusk, a food deliveryman stopped at a red light on Madison Avenue, despite no approaching traffic in the cross street. He was smoking a cigarette—and wearing a helmet. His bicycle even had lights. When the traffic light turned green, he road off. "We can do it," Mr. Stringer, the Manhattan Borough president, said. "Paris does it, Copenhagen does it. There's a way for all of us to get things right."